Common dolphins are, as the name suggests, widely distributed throughout tropical and temperate waters, and can be found in both nearshore and offshore environments. They are easily recognizable by their striking hourglass or criss-cross pattern that includes a yellowish or tan patch, when almost all other dolphins are limited to shades of black, white and grey. For a time common dolphins were divided into two species – short-beaked common dolphins (Delphinus delphis) and long-beaked common dolphins (D. capensis). 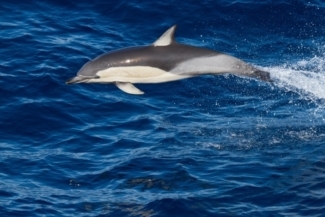 However, in 2015 genetic studies determined that all populations examined to date would be more logically grouped under one species (D. delphis) with four recognized subspecies of common dolphins throughout the species’ range: The common dolphin (D. d. delphis); Eastern North Pacific long-beaked common dolphin (D. d. bairdii ); the Black Sea common dolphin ( D. d. ponticus ); and the Indo-Pacific common dolphin ( D. d. tropicalis).1,2 Common dolphins can occur in nearshore or offshore environments, and while they are regularly seen in some areas, in others they are observed only as an added bonus to whale or dolphin watching tours that are focused on more predictable species. Common dolphin. Photograph courtesy of the International Whaling Commission. Taken on 20 July 2014 during the IWC POWER (Pacific Ocean Whale and Ecosystem Research) cruise; see www.iwc.int/power. Common dolphins’ unique hour glass pattern makes them fairly easy to distinguish from any other dolphin of the same size. However, some populations or individuals within populations may have ‘muddied’ or darkened colouring, making the pattern difficult to discern. Careful attention to facial patterns and striping may be required to distinguish them from other similar sized dolphins3. Common dolphins are found in warm temperate and tropical waters around the world ranging from approximate latitudes between 50°S and 50°N3,4. They are found both in deep open ocean waters and nearshore habitats. Because common dolphins occupy a wide range of habitats, from nearshore areas to open ocean, their prey also varies. While some populations feed in productive offshore zones and concentrate on fish and squid species associated with the deep scattering layer,5 others eat a variety of schooling fishes like anchovies, sardines, and mackerel, more common to continental shelf or coastal areas4,6-8. 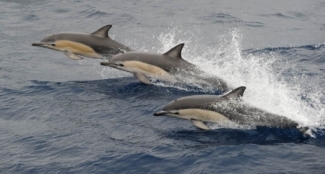 Common dolphins are known to form large mixed- species groups with spinner, striped, and spotted dolphins in areas where their ranges overlap9. This is the case in the Indian Ocean, particularly off the coast of South Africa where common dolphins are observed feeding with other cetacean species during the annual ‘sardine run’. Common dolphins are also known to associate with tuna when both species are feeding on schooling fish. Common dolphins can form groups of hundreds, or even thousands of individuals. Gestation is estimated to last 10-12 months, and females produce calves once every two to three years. Calves are weaned at between 5 and 6 months in the Black Sea, but possibly later in other areas. The maximum estimated age for the species is 30 years4. Common dolphins swimming in formation. Photograph courtesy of the International Whaling Commission. Taken during the IWC POWER (Pacific Ocean Whale and Ecosystem Research) cruise; see www.iwc.int/power. As with other dolphin species, killer whales and large sharks are the most likely natural predators of common dolphins, although they may also be preyed on by false killer whales, or pilot whales in some areas. In the Eastern Tropical Pacific, the Atlantic and the Indian Oceans, common dolphins’ association with yellowfin tuna brings the species into contact with tuna fisheries and puts them at risk of by-catch, 4,10 particularly in gillnet or purse seine fisheries11-14. While bycatch is pervasive throughout the species’ range, habitat degradation, contamination, disease, and overfishing are thought to play a bigger role in the documented population declines in the Black Sea and Mediterranean subpopulations15-18. There have been directed hunts for common dolphins in Japan and off the coast of Peru where they are used for bait shark fisheries as well as for human consumption19. 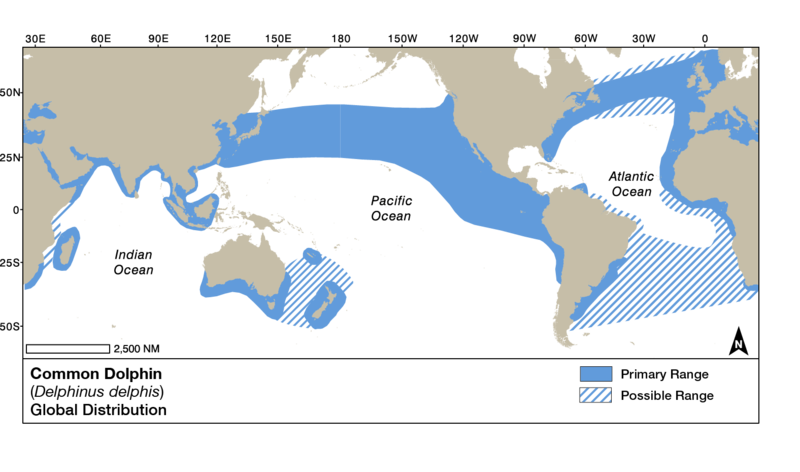 Globally, common dolphins are designated as Least Concern on the IUCN Red List of Threatened Species20, but the Mediterranean subpopulation is listed as Endangered15, and the Black Sea subspecies is listed as Vulnerable17. These latter two are listed on Appendix II of the Convention on Migratory Species (CMS). A common dolphin mother and calf next to an artisanal fishing vessel off the coast of Oman. Photo courtesy of Louisa Ponnampalam. Common dolphins can be active and acrobatic, porpoising and leaping, and sometimes approaching vessels to bowride. This makes them popular targets for dolphin watching operations. They are the second most frequently observed species off of Muscat, Oman, where they have been the focus of dolphin watching since 1996, although a study in 2006 raised concerns about the sustainability of dolphin watching practices there21. They are also the subject of dolphin watching in New Zealand, where studies have shown that dolphins spend less time feeding in the presence of tour boats, possibly jeopardizing dolphins’ fitness in the long term22. These studies reinforce the importance of guidelines to regulate the number of tour boats, approach distances, and other aspects of vessel behaviour around dolphins. Committee on Taxonomy. List of marine mammal species and subspecies. Society for Marine Mammalogy, www.marinemammalscience.org, consulted on 11 October 2017. (2017). Cunha, H. A. et al. Molecular and Morphological Differentiation of Common Dolphins (Delphinus sp.) in the Southwestern Atlantic: Testing the Two Species Hypothesis in Sympatry. PLOS ONE 10, e0140251, doi:10.1371/journal.pone.0140251 (2015). Perrin, W. in Encyclopedia of Marine Mammals Vol. Third Edition (eds B Würsig, J.G.M. Thewissen, & K.M. Kovacs) 205-209 (Academic Press, Elsevier, 2017 ). Ballance, L. T., Pitman, R. L. & Fiedler, P. C. Oceanographic influences on seabirds and cetaceans in the eastern tropical Pacific: A review. Progress in Oceanography 69, 360-390 (2006). Meynier, L., Stockin, K. A., Bando, M. K. H. & Duignan, P. J. Stomach contents of common dolphin (Delphinus sp.) from New Zealand waters. New Zealand Journal of Marine and Freshwater Research 42, 257-268 (2008). Spitz, J., Mourocq, E., Leaute, J., Quéro, J. & Ridoux, V. Prey selection by the common dolphin: Fulfilling high energy requirements with high quality food. Journal of experimental marine biology and ecology 390, 73–77 (2010). Young, D. D. & Cockcroft, V. G. Stomach contents of stranded Common Dolphins Delphinus delphis from the south-east of Southern Africa. International Journal of Mammalian Biology 60, 343-351 (1995). Querouil, S. et al. Why do dolphins form mixed-species associations in the Azores? Ethology 114, 1183–1194 (2008). Fernandez-Contreras, M., Cardona, L., Lockyer, C. & Aguilar, A. Incidental bycatch of short-beaked common dolphins (Delphinus delphis) by pairtrawlers off northwestern Spain. ICES Journal of Marine Science 67, 1732–1738 (2010). 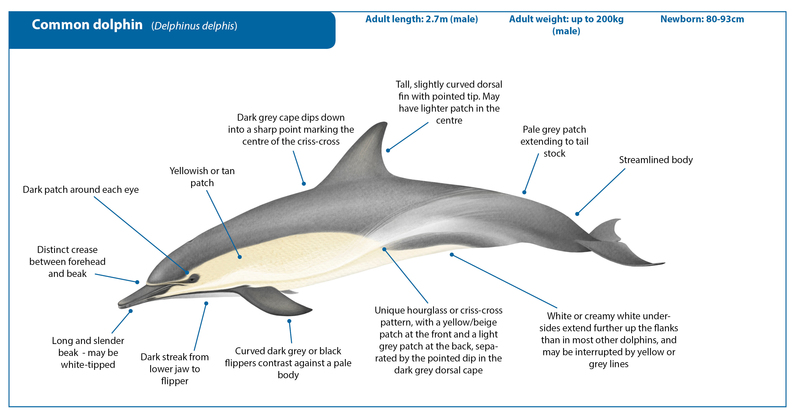 Hamer, D. J., Ward, T. M. & McGarvey, R. Measurement, management and mitigation of operational interactions between the South Australian sardine fishery and short-beaked common dolphins (Delphinus delphis). Biological Conservation 141, 2865-2878 (2008). Kuiken, T. et al. Mass mortality of common dolphins (Delphinus delphis) in south west England due to incidental capture in fishing gear. Veterinary Record 134, 81-89 (1994). Mannocci, L. et al. Assessing the Impact of Bycatch on Dolphin Populations: The Case of the Common Dolphin in the Eastern North Atlantic. PLoS ONE 7, e32615, doi:10.1371/journal.pone.0032615 (2012). Bearzi, G. Delphinus delphis Mediterraenan subpopulation in The IUCN Red List of Threatened Species (http://www.iucnredlist.org/det... Consulted October 2017, 2003). Bearzi, G. et al. Overfishing and the disappearance of short-beaked common dolphins from western Greece. Endangered Species Research 5, 1 - 12 (2008). Birkun Jr, A. Delphinus delphis spp. ponticus in The IUCN Red List of Threatened Species (http://www.iucnredlist.org/det... Consulted October 2017, 2008). Bearzi, G. et al. Ecology, status and conservation of short-beaked common dolphins Delphinus delphis in the Mediterranean Sea. Mammal Review 33, 224-252, doi:10.1046/j.1365-2907.2003.00032.x (2003). Hammond, P. S. et al. Delphinus delphis in The IUCN Red List of Threatened Species (http://www.iucnredlist.org/det... Consulted October 2017, 2008). Hammond, P. S. et al. Delphinus capensis in The IUCN Red List of Threatened Species (http://www.iucnredlist.org/det... Consulted October 2017, 2008). 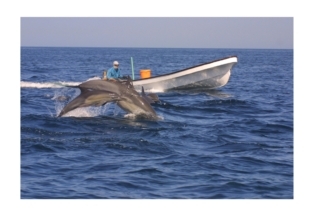 Ponnampalam, L. S. Dolphin Watching in Muscat, Sultanate of Oman: Tourist Perceptions and Actual Current Practice. Tourism in Marine Environments 7, 81-93, doi:10.3727/154427311X13038402065866 (2011). Meissner, A. M. et al. Behavioural effects of tourism onoceanic common dolphins, Delphinus sp., in New Zealand: The effects of markov analysis variations and current tour operator compliance with regulations. PLOS ONE 10, e0116962, doi:10.1371/journal.pone.0116962 (2015).